I would like to dedicate this post to Ryan. 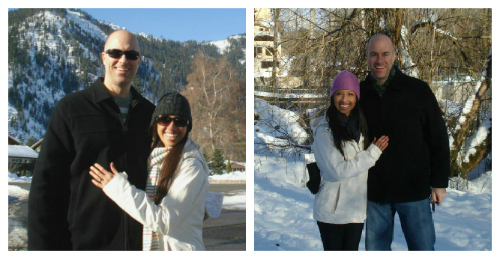 He called me out for doing the American girl "hand on chest" pose twice in my Leavenworth recap. His gorgeous love is also a perpetrator, and it boggles his European mind. To Ryan: If you're looking for the #1 offender, it's Megan. She has an alternative but doubts the buy-in. I think she's right. To those in a relationship with an American woman: If it bothers you, remember that it's our body language for "I love you." To my American friends: Do you pose like this too? Has anyone ever commented about it? If you read this blog and are not an American, what other Americanisms boggle your mind? I'm guilty of doing this pose on occasion. I get busted more for the "sorority" pose though...hand on hip and a slight crouch...oops. Problem is everytime I do it I feel like an impostor... I refer to it as the "engagement" pose. and clearly I am not engaged... impostor. At least you have a ring to show off in you pose. I have to agree- I always thought of this as an engagement pose. And I don't do it... but then Paul and I don't do much PDA-ing; we rarely even hold hands unless trying to navigate a crowd. So I suppose we'd not be in a "normal couple" survey anyway! HAHA. I just feel like all the alternatives are even more awkward. Especially (in our case) where our partner is SO much bigger than us..we cant like wrap our arm around them? I'm about to leave three pictures on your Facebook profile. Be sure to check it out; you'll appreciate it! Hahaha. Oh my gosh. I do this all the time. I don't think I ever realized this was an American thing. My husband's not American but he's never complained about it or said anything about it really. I should ask him what he thinks. Him being Mexican though has caused some serious photo fights. It is near impossible to get him to smile in pictures because Mexicans think smiling looks goofy. I, however, disagree. So that's a guaranteed fight every time. At first I thought you meant American Girl like the doll. And actually, your hand is kind of positioned like a dolls hand with your fingers together and your thumb slightly separate, ha. I don't know if I do this pose...now I'm curious. This blog and all the comments are hilarious. I am seriously giggling! This has made my day and it's only 12:23pm!! Happy Friday! I totes think this pose is a sign of endearment. I love how you think about your hubs and place your hand there... whether you do it on purpose or not. It's a great habit that I think shows your love!